Novels that are described as "unfilmable" usually fall into two broad categories. The first are books which are so densely packed with events, characters and ideas that even attempting to bring them to the screen would be a Sisyphean task, one which would almost certainly be met with scorn and indifference were the film to ever actually see the light of day. This is the reason why most adaptations of weighty works of literature tend to play like illustrated summaries, and why this Decemberists video is the closest the world will ever come to an adaptation of Infinite Jest. Yann Martel's 2001 novel Life of Pi falls very firmly into the latter category. The plot can be summed up in a single sentence - a castaway tries to survive whilst sharing a lifeboat with a tiger - since its elegant simplicity allows it to explore complex ideas about life, nature and faith through an often wrenching story of survival. It's a book that resonated with a lot of people, but it's also low on incident and deals in big themes, which is a potentially deadly combination when trying to turn a novel into populist entertainment. The film version of Life of Pi, directed by the delightfully unpredictable Ang Lee, downplays the spiritualism in favour of spectacular visuals. From the very beginning of the film, which shows the zoo owned by the family of Piscine "Pi" Patel (played by Suraj Sharma as a young man and by Irrfan Khan as an adult) as animals both real and fake wander through the lush greenery and strikingly colourful buildings, Life of Pi sets out to be a seriously stunning film. There's nary an ill-considered image in the entire picture, and even some of the effects that don't quite seem to work - such as enhancements done on Pi's uncle, a barrel-chested swimmer - serve to heighten the fable-like quality of the story, which always has one foot in the realm of the fantastic. That's not to say that the film completely avoids religiosity or questions of faith: it is still, after all, about a young man who adopts and practises Christianity, Hinduism and Islam simultaneously as he tries to love God in the fullest way possible. And his faith (or faiths) are tested when his father decides to sell the zoo and its animals in order to fund a move to Canada, which in turn leads to Pi being the only survivor after their freighter sinks. Or nearly the only survivor: he still has to spend 227 days trapped on a boat with a tiger named Richard Parker. 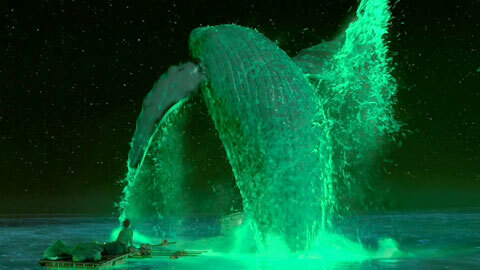 In focusing on the visual aspect of the story, and by loading it up with beautiful images of whales leaping through the air, roiling tempests and Richard Parker himself, who is a wonderfully realised bit of CGI trickery, Lee places a very strong emphasis on the physical and the practical side of Pi's story. Much of its time is spent detailing the steps he takes to stay alive, from creating a smaller raft attached to the lifeboat so he can keep some distance between himself and his stripey fellow traveler, to learning to fish in order to feed the cat, lest it decide that tasting Pi's flesh might be worth the inconvenience of getting wet. These scenes are also among the funniest in the film, which displays a charming and impish sense of humour that might not be expected of the director of Brokeback Mountain, and definitely wouldn't be expected of the director of Taking Woodstock. Yet despite the focus on the tangible, Lee manages to subtly work in the metaphysical as well, by showing the anguish that Pi experiences when he realises that he must kill and eat fish in order to sustain himself, something which goes against his personal ethos. Sharma, a complete newcomer to films, is particularly impressive in that moment, and in general makes a very strong impression, though there are a few too many moments where the film tries to put across his mental state by having him scream it to the heavens. There's a time and a place for beleaguered wailing, and even then it is best enjoyed in moderation. Lee also finds ways to weave the big themes into the spectacle, since a great deal of the film consists of Sharma marveling at the beauty of the world around him, entranced by the divinity of nature. Yet probably the most haunting effect in the film is its most simple: a scene in which the camera lingers on Pi's lifeboat at night, the calm sea reflecting the sky and making it seem as if the boy and the tiger are floating through the gulf of space. It's in these quieter moments that the film most convincingly entwines Pi's spiritual journey with his physical one, much more convincingly than the heavy-handed framing device in which the adult Pi relays his story to a writer (Rafe Spall) hoping to find inspiration in Pi's tale. Their scenes aren't bad, but they also serve little purpose than to highlight the themes that are abundantly clear throughout the rest of the film. Whilst the film ultimately winds up being more of a visual feat than an intellectual one - it only dips its toes in the waters of faith, rather than diving for the depths - Life of Pi is still a stunning technical achievement anchored by a strong, vulnerable central performance by Suraj Sharma. It takes a lot to make cannibalistic plants seem credible, but the fear in Suraj's eyes is often enough to make you want to believe that his story is true.